PA01. 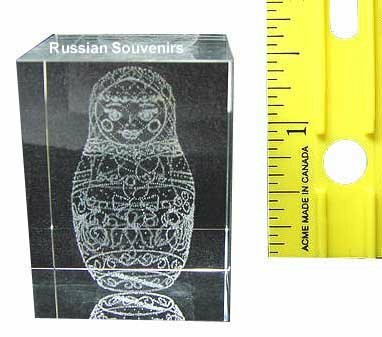 Laser Crystal Cube - 3D - "Matreshka" 1.5"
Height is 1.5", Length is 1.1" Width is 1.1". Produced by the latest advance technology. This is solid cube. Inside is a 3D etched by latest laser technology. This laser technology is based on penetration of the laser beam inside crystal cube on certain distance and small explosions inside cube. Each explosion is a dot. All pictures consist of sets of dots. Cube is transparent.